Creatures that are part human and part horse. They are followers of Dionysus. Centaurs are also referred to as Ixionidae because they are thought to be the offspring of Ixion, king of Thessaly, and a cloud. The cloud was transformed into Hera by Zeus who had found out that Hera was going to be unfaithful to him with Ixion. Centaurs were famous with their constant drunkenness and levity, and also with frequent violation of young girls. 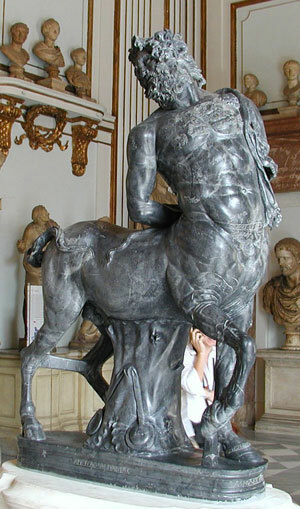 Centaur Chiron is the only exception to this typical behavior; he was the teacher and mentor to Asclepius, Jason, and Achilles.